PDF-Xchange is a feature packed and very customizable PDF viewer and editor. Tracker Software however discontinued PDF-XChange Viewer and now offer PDF-XChange Editor in its place. The two products are very much alike it's only that the Editor is more feature-packed and includes an updated interface (ribbon menu & touch optimized UI). The PDF Editing features however require one to buy a license, otherwise the rest of the features are free. That said, for what we want to do here today you don't have to upgrade to the new PDF Editor. The features we'll be making use of are exactly the same in both. Personally I got interested in changing the background color of PDF as I realized the bright white that's universally used in PDFs is very hard on the eyes. It's simply not the best experience especially when reading a book. 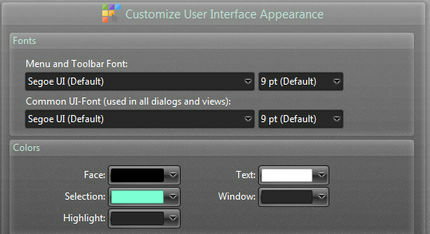 Fortunately, PDF-Xchange does provides us with options to customize the background and font colors. This is however temporary and does not change the actual background color in the PDF. It merely overrides the colors used. To change the actual background color, editing the PDF would be necessary. 1. Go to the program's preferences by pressing Ctrl+K on your keyboard. 2. In the settings category click on Accessibility. 3. 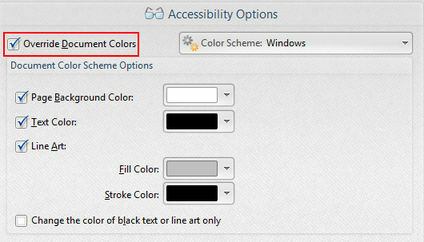 At the top enable the Override Document Colors. 4. Now we can use a pre-defined color scheme or we can create one for ourselves. The pre-defined ones include one that adapts to the color scheme you use on Windows and then a couple of high-contrast schemes (Green Text on Black Background, Yellow Text on Black Background etc.). 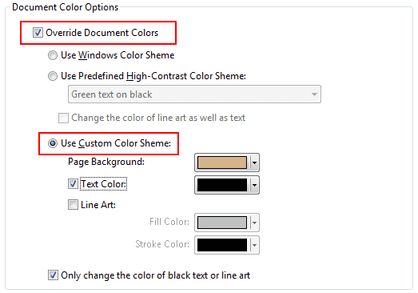 To create a custom color scheme, just select your color preferences under Page Background color and Text color. If your PDF has lines, you can also set the colors for the Line Art. I've found however that enabling the Change the color of black text or Line Art only yields the best results. This ensures that these elements are viewable even under the new color scheme. As I side note, I've also found that black text on warm background colors (e.g. beige, light orange, gold, rose, light yellow etc) is what works best for me. I also tend to highlight PDFs and these schemes work well with that. A black background on the other hand renders highlighting useless. 5. After you're done defining the colors, click on the Apply button then Ok. If you had a PDF opened the new color scheme should take effect. From now on every PDF you open will use that color scheme. 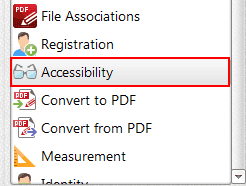 Changing the background color will not work in PDFs composed of images such as scanned PDFs. Now if you're like me, you may also consider going a step further and changing the color scheme of the program's UI. This way you can have an overall color scheme or a night-mode as it's in my case. To do that, in the Preferences go to Customize UI and select the colors you wish for the Window, Text, Face etc. A Dark Gray/Black for Window, White/Light Gray for Text and Dark Gray/Black for Face as shown below yields a night mode which when combined with a warm PDF colour background, makes for a reading experience very easy on the eyes. You can play around with the colors and find what works best for you. There's a Reset button there should you wish to revert to the original scheme. Cheers!